"The Media Production course has really pushed me to follow my ambitions"
"Since coming to UoG I've learned so many skills and approaches, and most importantly I've found my passion for music photography and promotion. In my second year, I started a company called 'Cut The Cord Media' with a classmate, providing high-quality promotional opportunities for new musicians and bands, and also grassroots venues and events. The business now covers promotional and live photography, video production, social media and events management, and we're looking into virtual reality tours of music venues. The University of Gloucestershire, and more specifically, the Media Production course has really pushed me to follow my ambitions and work hard to get the skills I need to become a professional in my field." 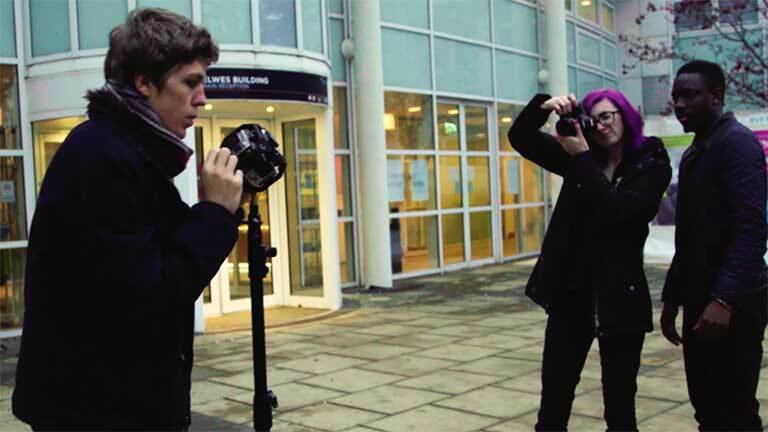 Experience the reality of one the UK's best universities for Media Production. Get a chance to work with the stars. Student Howard Berry interviewed Brian Blessed, Steven Spielberg and more for his documentary. Meet and learn from respected practitioners such as alumnus Leigh Moore who worked as BT Sport's social media content editor. The space to explore web technologies, moving images, app development and emergent tech such as VR. We create graduates that are always thinking two years ahead of their competition. With this in mind, you will have opportunities to work with tools such as VR cameras, virtual reality software and AR technologies such as Google Project Tango. Experiment with a wide range of technology and bring it all together as a stronger graduate who can thrive in a large and growing industry. "My background is in film-making and cinematography but in recent years my practice has expanded to include virtual reality and transmedia which I find absolutely fascinating. It's amazing to see how new media professionals combine so many elements of practice; our course reflects this by bringing traditional communications together with emergent ideas and technologies. During my time at the university, I have continued working in the media industry and my latest feature film was released in March 2017. My industry experience means I can help students produce work that is being broadcast nationally and has won and been nominated for prestigious awards such as the Royal Television Society Awards and the Griersons Award." In recent years, a new type of media professional has emerged. Multi-skilled and familiar with a range of media platforms, they drive creative industries in new and exciting directions. 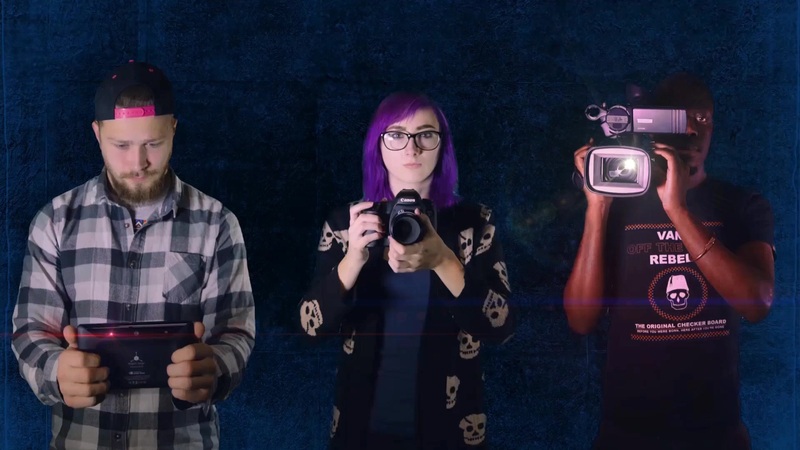 This Media Production course provides students who are keen to work in cutting-edge media industries with opportunities to develop a unique set of skills and experiences. You will cover a range of subjects including interactive design, contemporary moving image, web technologies, graphics and animation right from your first year. You will also have opportunities to develop in progressive and emergent fields such as app development and Virtual Reality, with tools including GoPro VR and Google Project Tango. Work placements are built into the curriculum, giving you essential real-world skills and industry contacts. Students have worked for many high-profile media outlets including production companies, newspapers and start-ups, producing exciting digital content. Strong links with industry mean that you will be able to meet and learn from respected practitioners. Guests at the annual media school festival have included YouTube entrepreneurs Yogscast and head of digital for BT Sport’s social media content editor, Leigh Moore. You can also take part in field trips, previously we have visited the BBC, the Annecy International Animated Film Festival, Amsterdam for a transmedia project and NBC New York, taking a tour of sets including the newsroom, Saturday Night Live and the Rosie O'Donnell Show. Get Media Production course updates and hear more about studying with us. Uniquely to this degree, your first year will give you the ability to experiment with a wide range of different media and skills within a ground-breaking new course structure. Based around emergent concepts such as Google’s ‘Sprint’ Project, the curriculum design itself will help you develop contemporary skills. You will have opportunities to elect specialist pathways of study throughout your three years, and in your final year you will bring everything together in a large self-directed project, plus research projects and a work placement. Our staff are all contemporary practitioners and published in their fields, and have a wealth of contacts and experience within emergent media industries, including high-profile creative agencies, new-media and groundbreaking technology companies, film and production companies and elite sports teams. International Students: Please see the full details of entry requirements in your country. If you do not meet the academic and English language requirements, you should consider a preparation course at INTO University of Gloucestershire, which will help to prepare you for study on this degree. INTO University of Gloucestershire is based at our Park campus and offers a range of courses including International Foundation Art, Design and Media and Undergraduate Degree with International Foundation. Fill in the form below and we'll be in touch with Media Production updates, upcoming events and everything you need to know about university life.